This market is a sea of colour in all seasons. The vibrant colours and range of flowers and plants make this a truly fascinating place to visit. Some of the stalls make the most of the available space by overhanging the canal or being supported by boats You can buy your tulips as souvenirs or just browse around and smell the flower fragrances. There is no pressure to buy anything, so you can just spend time looking at what’s available. If you do want to buy though, the stall holders are all very knowledgable and are happy to help – most speak excellent English. We visited in December, but even in the dark winter, the colours were stunning. A visit to the market will not take more than an hour, but it’s well worth it. Open daily. Monday to Saturday, 9am – 5.30pm, Sunday 11am – 5.30pm. 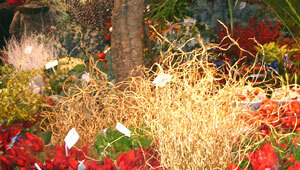 Address: The Amsterdam flower market is on the Singel canal between the Koningsplein and the Muntplein.